Are we in the middle of a mass extinction, like that of the dinosaurs? By all accounts, yes. In a highly significant paper shortly to be published in the journal Science, a team of conservation scientists has revised current rates of species loss upwards. According to the analysis, species are being lost at least a thousand times faster than the background rate. Part of the problem is that biodiversity, and therefore the current rate of extinction, is so poorly understood. Estimates of the total number of species range from 5±3 million to 11 million animal species worldwide. Given this uncertainty, the authors grapple with quantifying the natural, or background, rate of extinction. This number gives a baseline against which to evaluate the increased rate of extinction due to human activities. Using a metric of extinctions per million species-years (E/MSY), data from various sources indicate that present extinction rates are at least ~100 E/MSY, or a thousand times higher than the background rate of 0.1 E/MSY, estimated from fossil evidence. The good news is that scientists know more than ever before about areas where at-risk species are located, and that new technologies are helping scientists to discover new species and monitor populations, and therefore focus conservation actions more efficiently. The team used a variety of tools, including GIS data, to create high resolution biodiversity maps for vertebrate species. These identify the hottest of biodiversity hotspots, and should help conservation scientists to prioritize areas for protection and restoration. 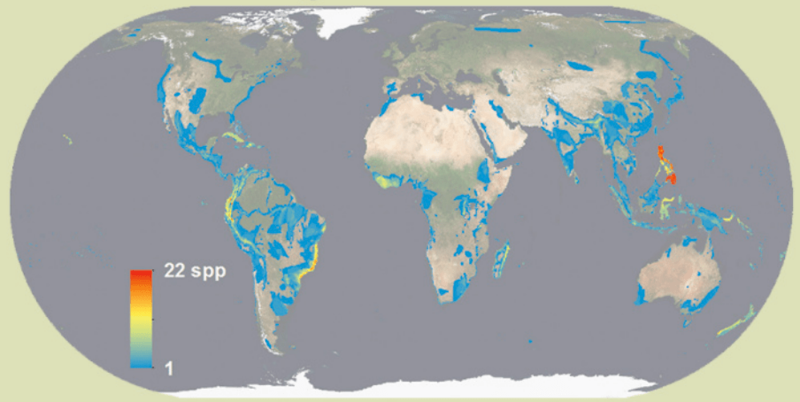 By combining range data with conservation status, the scientists show distinctive areas for conservation. In the case of birds, for example, the Atlantic coastal rainforest of Brazil, the northern Andes, west Africa and the Philippines are regions with the highest densities of threatened species within small geographic areas. These data suggest that conservation organizations should consider highly targeted protection and restoration measures, rather than focusing on the conventional conservation approach of fencing off large areas. The Science article will appear online Thursday May 29, with an official publication date of Friday, May 30. June 20, 2014 — A link to a free PDF of the original Science paper is available on Clinton Jenkins’ website. Click here for the PDF.